The hillside perch and vacation destination of Gourdon has stunning views over the Loup Valley towards the Mediterranean Coastline of France. The village of Gourdon is a typical, romantic village in the Provence region of France with shops filled with locally produced perfume, produce, and local art. There are stunning views from the square - la Place Victoria, over the dramatic gorge, across to the sea with Antibes, and Cap Roux in the distance in the Cote d'Azur region of France, a popular vacation distination. The Village of Gourdon itself is surrounded by ramparts and has a 12th century Chateau called the Chateau de Gourdon which was built on foundations of what was once a Saracen fortress. There are great views also from the Terrace of the Chateau. Gourdon is a beautiful village in the Provence region of France, which is a haven and wonderful vacation destination with fragrances wafting through the air and a peaceful atmosphere. Photo of the quaint village of Gourdon perched on the hillside in the Provence, France. ... from around the globe. 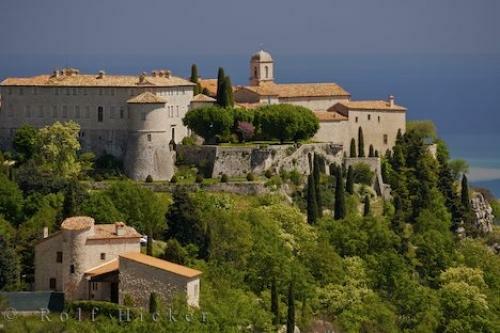 Gourdon, Gorges du Loup, Alpes Maritimes, Provence, France, Europe. I photographed this photo with the digital SLR camera model Canon EOS-1Ds Mark II, aperture of f/7.1, exposure time of 1/250 sec. on ISO 100, as always I used a original Canon Lens, the focus lenght for this picture was 300mm.